As I reread Daniel Ferrera 2012 Outlook, I noticed his 2009 Outlook of general market chart from 2009-2018 showed a very nice flow. 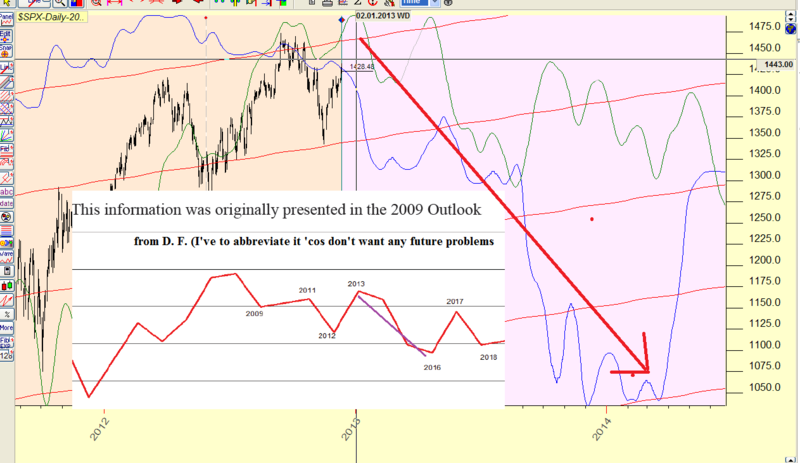 I then start to look in to $SPX for 2013-2014 using TimingSolution. I found similarity using Mercury cycle. Whether or not it'll be correct I dunno, but I've been trading with EUR/USD for quite a bit and it has been helping me! So as for 2013-2014, software that I am using indicate that $SPX will come down. My chart is the background chart I superimposed the little chart of D.F. on mine. Hi unclepips, can you share your method by using mercury cycle in TS please?